Whether you're calling it making resolutions, setting goals, or just stepping into 2015 feeling brand new, chances are, you're looking to break some bad habits. January is in full swing, and there's no time like the present to get started on creating healthier habits for you, and your natural hair. These 15 are a great place to start. 1. Trying to Make Products "Work"
I hate it when products don't work, especially when they come nowhere near meeting the claims they make on the bottle or jar. What I hate even more than defunct products is spending my time and wasting precious natural hair resources trying to fix said product. I understand not wanting to waste money as much as the next natural, but it's not my job to play home mixtress to make up for a product's shortcomings. Natural hair products are saturating the market, and 2015 is time for no more excuses. If you know a product doesn't work, don't buy it again. If you're purchasing a new product, test it out on a small section of hair first. That way, if you discover that it won't meet your expectations, you can promptly return it to the store (if the store accepts returns), or save it for a product swap with curlfriends without the bottle being half empty. I don't see protective styles going out of style anytime soon (especially crochet braids), so this is one to most certainly remember for 2015. Protective styles only work if the hair that is being protected remains cared for. That means cleansing, conditioning, and moisturizing regularly. Applying oil every few days for 2 months between installs is not enough, and will surely defeat the purpose of protective styling to begin with. This one isn't so much about hair habits as much as it is about decorum, respect, and community building. I follow several natural hair social media pages and popular bloggers, and I've come to notice a nasty little pattern. There's always that *one* who ridicules, demeans, name-calls, and downright disrespects others on a thread. You don't have to be rude to disagree, nor do you need to personally attack someone to get your point across. We are a community that is designed to support, uplift, and encourage each other. We are all individuals, and everyone won't see eye-to-eye all the time, but there's no need to be a Petty Betty. If you can't articulate your thoughts and feelings in a constructive way that doesn't drag a fellow naturalista through the mud, then just....log out. The natural hair product industry is booming. I feel like every other week, a brand is releasing a "natural" or "curly" haircare product line. I'm not talking about new brands emerging on the scene, I'm talking about companies that have been around for years -- who either weren't interested in taking your money before, or who now just want more of it. You know what I mean -- slightly tweaking a formula base, sprinkling in a few random extracts at 32nd and 33rd on the ingredient list, and then releasing it under the guise of an entirely new textured hair care system. Ladies, in 2015 let's stop falling for the hype and being suckered in by exaggerated claims. Let's commit to spending our money more wisely (and supporting more small businesses). When I first went natural, it was all about doing the most. Pre-pre-poos, 8 hour detangling sessions, complex co-washes, and overnight deep conditioning were all the rage. Then, somewhere in early 2014 cutting corners to cut down on wash day started trending. How about we reach a happy medium in 2015 -- not cutting corners, but not doing the absolute most, either? Does doing exactly what your hair needs (nothing more, nothing less) sound about right? I know, as human beings we have a need to categorize and classify things. Most of the times, it makes things easier. But texture typing has turned going natural into a ball of confusion. It's incredibly subjective, and because we all have different hair, searching "4a natural hair" can yield you a wiiiiide range of results. By now, we've learned that while texture typing can be helpful (especially in creating support groups for naturalistas), there are several other indicators that serve us better in managing the health of our hair. Click here to learn more about why porosity, density, thickness, and elasticity in natural hair are important. Note: make use of reviews. Plenty of bloggers (myself included) put all that product junkie-ing to good use in the form of writing and filming reviews, to help you make informed decisions about product purchases. I can't tell you how many reviews from other naturalistas have had me put down a product and walk away. Are we over not trimming our ends yet? I hope so. There's no quicker way to stall out your growth journey then by holding on to bad ends. Click here to read more about why trimming your ends is good for the overall health and length retention of your hair. If you're starting a growth journey this January, get a good trim first. Your 2015 hair will thank you. Conversations about seeking out professional stylists for natural hair care are always a mixed bag. Some love visiting salons and getting pampered by trusted professional hands, and others have been burned so badly (both literally ans figuratively) that they refuse to let another set of hands come within 15 feet of their manes. I understand both sides of the argument, but I also know when I've been beat. If you are looking for a new cut, color, or another huge undertaking for your natural hair, you may be better off in the hands of a professional. I know the natural hair community is huge on DIY, and if there are things you feel comfortable doing on your own, or that you've learned to do, then do them. But there are certain things I could absolutely never trust myself with, and to avoid a major mishap (like losing all my hair) I've seen a professional for them. Both of my Deva Cuts have been done professionally, as has my red color. I even recently resigned to letting a professional do my most recent flat ironing, because I didn't feel like spending 7 hours doing it myself. I will say, before you plop down in the chair, do your homework. Look at their clients on social media, yelp them, and if you know people that have personally visited them, get their honest opinions. One of the first things I learned how to do when I decided to go natural was read the ingredient labels. Originally, I did it out of curiosity. Then, I did it to avoid certain ingredients. Ultimately I arrived to where I am now -- scouring ingredient lists to determine if the contents justify the price point and what I'm willing to pay. I still care about what's in my products, but I care even more about being ripped off. Whatever your reasons are, make 2015 the year you begin scrutinizing ingredient labels a little more. Know about what you're getting in to before you get into it! 11. The Fear of Breaking Natural Hair "Rules"
There's a fine line between appreciating and lusting after someone else's hair, and we walk that line almost daily on social media. Hashtags like #curlcrush get thrown around regularly, and I understand. There are tons of ladies out there with gorgeous heads of hair. But don't make the mistake of loving theirs to the detriment of your own. Your hair is just as dynamic and beautiful. Try loving on it instead of loathing its limitations in 2015. When I get emails about hair woes, one of the most common things I notice is that ladies aren't deep conditioning regularly. The benefits of deep conditioning have been espoused over, and over, and over again. Just trust me here. Whether you need protein, moisture, or both, deep conditioning your hair is an absolute must. Not only does a good deep conditioner keep your hair bouncy, vibrant, and soft, it helps your hair retain moisture, elasticity, and can even help correct cuticle damage. If you're not deep conditioning regularly, then make 2015 the year you start. Click here for my favorite deep conditioners. Another byproduct of the self-sufficiency of the natural hair community is the tendency to self-diagnose. Serious thinning of hair, excessive flaking of the scalp, losing patches of hair, and tender bumps on the roots may need more than just some nightly JBCO scalp massages. In fact, those symptoms may be precursors to larger medical issues. The blogs can't solve all of your problems -- sometimes professional medical attention is necessary. Let's be about that business in 2015. In the same vein as number 11, life is too short to not enjoy your natural hair and journey. Throw the rules out of the window and just have fun. So what if it's winter time? If you want to wear a wash and go, winterize it! If you want some color, live a little and go for it! Dying to do an asymmetrical cut? Do it! Hair grows back! Whether you're in the TWA, transitioning, awkward midi-length, or three year stage, own it and have fun with it. The more you enjoy your natural hair journey and don't allow yourself to be stifled by rules, the more you'll fall in love with your own hair. 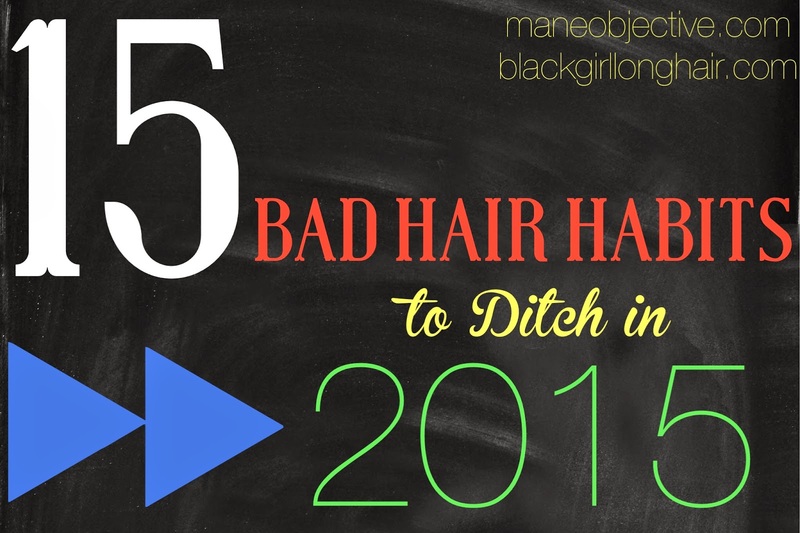 What are some bad hair habits you're ditching in 2015? Share below! Threatening myself that I'm going to get a perm on the tough days. I made the commitment to go natural so even when my curls are tangled and I can't seem to get the knot out I will not make an appointment to the salon to get a perm. Just keep telling yourself that! We're in this together!!!! Following your recommendations, it is easy to break some bad habits. Thanks for sharing. You're certainly right saying that the blogs can't solve all of your problems. And sometimes professional medical attention is necessary. This information will be definitely used in my thesis proposal. Cheers!